As much as I love salad, I typically stick to my favorite stand byes and don’t venture out with interesting flavors nearly enough. 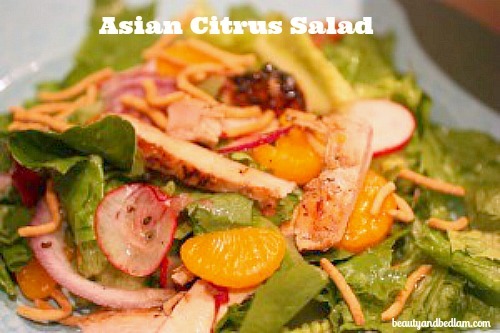 I am so glad that I broke loose with this Asian Citrus Salad. I would never have guessed that this blend of flavors would be so delicious. My children call it the best salad ever! Yes, I know it’s a matter of opinion, but I’m just saying – you won’t be disappointed. This has been a family favorite for years and I can never make enough of it. No matter how large I make the salad, it’s gone….every time. I wish that I could tell you exact amounts, but I have been making this salad for so long, I don’t even have an original recipe. Add the ingredients to taste. Grilled chicken or turkey (I add a bit of soy sauce on it). My children will eat plates and plates of salad as long as this dressing is drizzled on top. I was first introduced to this recipe from the side of my PC dressing carafe. I could never share the recipe with any one since the exact amounts are not given, so I finally adapted it to our needs after years of being asked for the recipe. Give this a try…your kids will even eat radishes with this dressing, and that’s quite a feat for any mom. I told you I could never make enough. Our children literally take pieces of lettuce to wipe up the last bit of dressing. I'm going to have to try your salad now! Ranch dressing used to have the same effect on my daughter(but she would just lick it up or use her fingers). She is more reserved now and my little boy doesn't seem to like ranch much- at least not on his veggies or chicken nuggets! I use that same recipe of the side of the pc container. We love it. Definitely on the menu next week! Looks so good to me… hubs wouldn't touch it. Must keep ingredients on hand for when he's gone. HA! I have the same container and use the same recipe! We will be having this salad tomorrow night. This salad is very popular in our house as well! For a while I substituted olive oil, but it was getting hard when I refrigerated it, so now I am back to canola oil or a mix of olive and canola. Looks fantastic 🙂 Have you ever sautéed radishes in a little butter and salt? So yummy! I have one similar to this that I make, but the dressing has peanut butter in it—I always thought tasted a little weird! I'm excited to try this one out! Sounds yummy! Looks yummy, definately going to have to try this! Thanks for sharing! Salads are a staple for The Husbands lunch during the summer and this one is just the thing to keep him from getting bored with what I'm making! Thank you for hosting week in and week out! That salad looks really delicious! It's perfect for summer, too, since the chicken can be cooked in advance. I've missed for a few weeks, I was having trouble keeping your site open. Glad to be back. Hey, Jen, that salad sounds delish! I love those gourmet salads. I make one similar with mandarin oranges, but this one sounds great. Just had one similar at Zaxby's last night for dinner, the Zensation. It's yum too. Don't you love that PC salad dressing mixer, I have one too! Jen, That salad sounds fabulous. Love the oranges. I will have to make this salad soon. This sounds delicious, I'm going to have to give it a try! I love salads, and this one looks fantastic! I can't wait to try it! I posted a link for my strawberry rhubarb crisp recipe. Thank you for hosting! That looks just delicious. 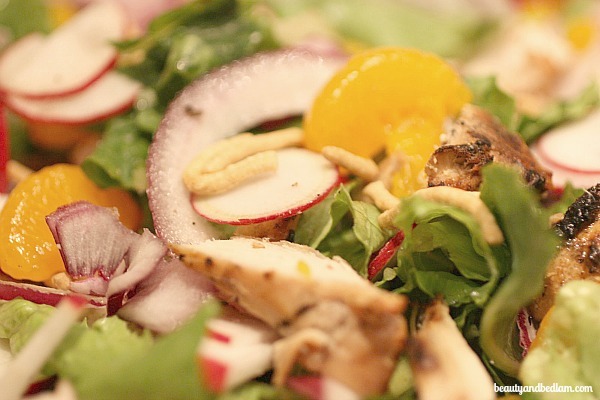 We love main dish salads at our house, so I can't wait to give this a try! Love salads during the summer. Anything to keep from turning the oven on! This dressing sounds divine. Thanks for sharing and hosting. I love salads and that one looks so yummy! Oh so yummy! And yes…that dressing sounds way too good. I would wipe the bowl with extra lettuce too! No excuse for ordering pizza tonight! We're having a Women's Night Good for the Heart event Thursday with a healthy carry-in dinner … lots of great ideas here. This salad look scrumptious. I am definitely trying this today. My teens love ranch for everything also. Hey Miss Jen! That salad is looking very yummy. I love to eat salad during the summer. So cool and light and fast and easy. Thanks for sharing this yummy one with me~ Will have to try it soon. Sounds yummy–we love asian flavors in our house!